SAVAGE MESSIAH—–CULT JOURNAL OF LONDON PSYCHOGEOGRAPHY…by Laura Oldfield Ford………..
SATURDAY MAY 17TH 5PM-9PM HOUSMANS BOOKSHOP, CALEDONIAN ROAD, KINGS CROSS N1. ………………………>>>>>>>>The WE ARE BAD collective calls on all psychogeographers, miscreants and deviants to join them for a drink at Housmans to mark the launch of Issue 9 ‘HEATHROW-the psychogeography of paranoia’—-Sipson, Three Magpies, Climate camp, treaty centre and more!!!!!!!!!!!!!!!!!!!!!!!!!!!!!!!!!!!!! !…………………………………..,,,,,,,,followed by a………………………. “””””’ Taking De Quincey, Rimbaud and Verlaine as his spiritual guides, John Wild will facilitate a drift from Housman’s Bookshop Kings cross towards Hackney. You are invited to come along, armed with red wine, to drink, walk and drift. The drift is not a guided tour, rather a psychogeographic wander, an invitation to become lost and experience London in a haze of intoxication. As we immerse ourselves in the sensory experience of the drift, location data created by John Wilds mobile phone will be collated and archived. This location data reduces living places to a series of annotated grid references creating a secondary layer of space, a Cartesian grid of dataSPACE, which is overlaid onto the City and is suggestive of rationality, order, logic, Surveillance and control. This data will stand in stark contrast to the blurred recollections of our night of drinking and wandering.
! VIVA SAVAGE MESSIAH ! SAVAGE MESSIAH DEMANDS THE ABOLITION OF ALL ZONES!! DESTROY CARTESIAN RHETORIC, SMASH THE VILLE RADIEUSE, SAVAGE MESSIAH IS CALLING FOR A MASS RETURN TO THE LABYRINTH!!! ROBIN BALE -expect tourettes outbursts, incantations and poetic ranting. BRADFORD BAHAMAS-noise from broken computers, circuit boards, discarded electronic gadgetry in skips……. First 50 copies of Savage Messiah will be accompanied by a free limited edition film by Majed A “ Kings Cross to Hackney Wick”. ” all from the wearebad blog here. To aid my research I attended the Material Theatre/ Theatre Materials Conference held at the Central School for Speech and Drama. The conference was dedicated to how performance could be inspired by materiality. I found this conference extremely useful in thinking about how the material environment might help me to develop projects, especially a hunt which requires interacting and reinterpreting the environment. I was surprisingly uplifted by the conference even though I had just lost a dear relative just before it. One of the talks that really inspired me was the keynote speaker Anne Bogart of Columbia University. I really enjoyed her speech as it reflected upon in the theatre as a technology of memory and understanding desire. One thing she discussed was James Joyce’s distinction between Kinetic art and art that makes you stop. For Joyce art that made you stop was superior to kinetic art as it made you ask questions. Bogart explains that this is due to the fact that kinetic art deals with desire. The trouble with kinetic art is when it manipulates the audience in order to direct their desires. This sort of art is indeed fascist. Commercials and Spielberg films, deploy such methods. However art which allows its audience experiment with movement allows for spaces in which to understand the complexities of desire. Spaces of authenticity are created by invoking the past and the future into the breath of the present. If theatre is the art of ritual then it finds itself attached to tradition. This presents a challenge to how new technologies should be used. ew technologies should be used to accentuate the soul of the art and not take it over. I take Hegel’s side in where I believe that art should marry the intellectual with the sensual. Too much technology or conceptualizing defeats the soul of the art form. Furthermore I would like to argue that art should also strive to reinterpret tradition in order to recreate spaces and the dynamics of desire therein. Why should expirementing with space allow for us to reflect upon our desires? What is the correlation between space and desire? Here I think of a paper I have recently read by Derek Gregory on Lacan and Geography which is essentially a comparison of Lacan and Lefebvre. Lacan’s project defines desire in terms of a lack or the empty signifier. Desire transposes the lack in the subject on the object. The symbolic order or the distinction between signifier and signified in Lacan’s system is how the human makes sense of the diruption between the fragmentation of the real and the imaginary whole through the self’s reflection in the mirror. Lefebvre’s critique, however, understands the mirror image in reverse. It is the mirror that abstracts the experience of the body from its natural rythm as the domincance of the visual takes over all other aspects of experience. The mirror becomes a site for the production of abstract space via the gaze where experience undergoes scotimization. Abstract space is then replicated in the landscape producing architectures of alienation where are desires become subject to violence. In abstract space everything becomes textual and therefore fragmented as experience is politicized through the symbolic order which produces binary distinctions. What i see as interesting in the politics of space and the abstration of space is how textuality can be exchange for intertexuality in order to create new spaces. I believe this is what good art tries to acheive; the third space. How can reinterpreting the gaze ritual server to reinterpret spaces that produce social rather than anti-social behaviours. Also if theatre is an area for realizing desire is it not also a place for realizing loss? If desire is something that is derived from an empty source rather than an empty object then how does getting lost confront issues of loss and death? I actually think that the poetic of the snark reveals the absurdity in politics to evade death. Does entering into the mysterious help us to create a meaningful ritual in which to defamliarize from abstract spaces of alienation? For future projects I want to conduct walks in cemeteries. Also I know some ghost hunters I contacted for a project from last year, I wonder how they might be able to help me correlate the kinetic poetic with loss and understanding the traces of the past which the spaces we inhabit now have inherited. Here I would like to speak about the difficulty Caroline and I encountered in reflecting upon the snark hunt and how we wanted to take our psychogeography further. We found the absurd, circular-like logic of the snark dance as something useful. We loved absurdity in so far as it made thoughts move in messy directions so that ends could not meet. Even still there is something in this movement I find very meaningful. I think this makes a mess of dialectics and I am pretty sure this is what the surrealists had in mind in their use of strange juxtaposition as a creation of new spaces for thought to roam freely from the fascism of linear logics. 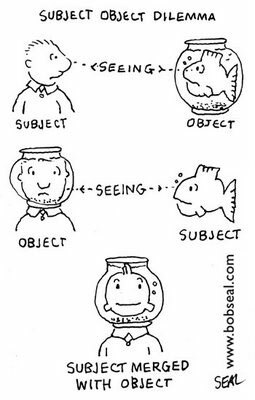 The cycle of absurdity is very interesting especially when we look to how this can apply it to the space between polarities (which might be understood as the gaze) in relation to recursion or the application of the absurd to reflection and the infamous gaze. A side project I had been working on was a documentary or ethnography of a pie and mash shop in East London. A major challenge to this project were the many mirrors within the setting that kept revealing the camera in our footage. This made me very aware of my own Western gaze towards East London. Seeing myself behind the camera and in front of the camera made a maze of my thoughts in determining where I could situate myself in a responsible representation of this project. I reconciled the situation by juxtaposing the mechanics of my cinematic project to the mechanics that were in the shop. The winding sound of the machines used to make pies echoed the sound of a film projector. Using the allegory of mechanical production was actually a very interesting technology with which to confront the gaze. I think that allegory is a useful device in which to make some sense or meaningful experience within the labyrinth created by complicated modes of reflection. In thinking about the history of cinema in relation to the history of anthropology and this thing called colonialism I began to think about the surrealists. One thing Caroline and I loved about avant-garde cinema was its creative use of the mechanics of documentation in order to produce surreal content. One major critique of surrealism is the feminist critique as the surrealist movement has a very sexist undertone. For example the ubiquitous objectification and disfigurement of the female body in surrealist painting (think Dali). 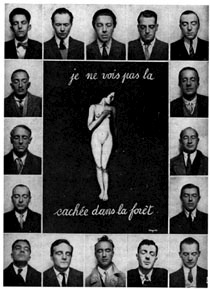 The surrealist manifesto was not signed by a single woman and female contribution to the surrealist project is severely marginalized. Leonora Carrington (a contemporary of Breton) has produced writing and paintings that blow many surrealists out of the water! But I bet even some of the biggest fans of surrealism have never even heard of her. Magritte (1929): Je ne vois pas la (femme) cachee dans le foret meaning I do not see the woman hidden in the forest. A great example of the surrealist objectification of the female, it depicts prominent figures in the surrealist movement. This image was found in a fantastic article on the blog: Letters from a Librarian. Now I would like to argue that the objectification of the woman in the surrealist project stems from the movement’s relationship to the history of cinema. The camera is the technology of objectification as its very mechanics are the gaze hatis higly gendered. The cinema allows for the audience to see as flaneur not flaneuse (the prostitute). Now I do not want to go into this much further. But why the gaze whether it be gendered or colonialist is important to this blog is that it presents something for the interactive project to think about. The gaze should be complicated in interactive based projects and media. The potential for reflexivity in these projects could compromise the simplicity of the gaze and therefore the process of objectification. If the gaze is reflected upon itself it was in my recent experience then what is then objectified?? Does this not echo the complexities of the digital postcolonial age. Do internet networks do the work of multiple reflections opening up passages for the gaze to be distorted? Using the mirror or echo allegory has really helped me in my filmmaking but I also hope for it to challenge my research for the creation of interactive activities. I think part of role playing is our individual rituals of gazing… Who are we allowed to gaze at and in which context? Returning to the snark… how does an empty signifyer affect this discussion? What happens when a hunt is for an object that does not exist? This is something that caroline and I did not take into enough consideration before hand. I think in order for this to work we would have to really implement our theatrical skills. Maybe our acting abilities just arent up to par for such a task. However until then, I think something to take a away from this experience is this rethinking of the dialectics that I believe the surrealists were aware of in their praise of the absurd. Through the absurd I think we are able to fill inthe gaps of strange juxtaposition in order to form a new space for synthesis. I am not saying that the surrealists advocated the unraveling of absolute spirit. However, I think there is something to be said for this process. Also the Surrealists were able to create a playful atmosphere for our thoughts to roam. This is something I really love about the genre. So what I ultimately would like to do is to take surrealist technique and exorcise the gaze. 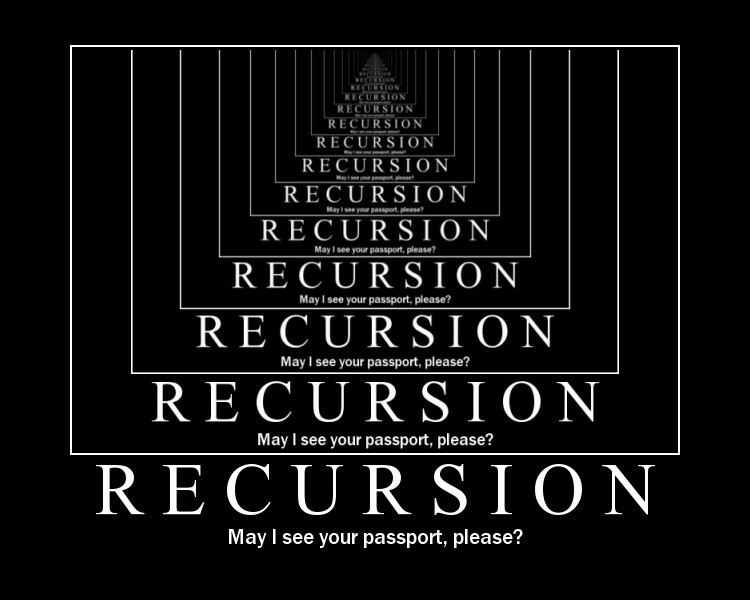 I think this has to come from reflexivity from all sides.. the technology of recursion could underline the labyrinth of our being inorder for us to escape modes of othering. Now if this soundslike a complicated mess, I think it is supposed to be, but maybe such a mess can be magical. I think that putting absurd cycles into movement would be great. Maybe tryingto walk in a perfect circle around the city. Or playing with the circle line. Implementing different typesof cycles in these walks…The moon cycle, the day cycle, a bicycle? circulation as allegory: This again approaches my interest in documentation. Circulation of products, the body, etc. Reproductive cycles and the digital age. Using mirrors in order to create interesting film projections or installation.. This is something I have been thinking about using besides editing for film experimentation.